Let me lead off by pointing this out: had President Donald Trump fumbled his first State of the Union, I would have said so. As a latter day supporter riding in the caboose of the Trump train, I hardly count myself as a sycophant. That said the man whose coarseness was defining his administration turned a corner on Tuesday night delivering a masterful State of the Union address that trumped anything I had seen since Ronald Reagan. This wasn’t the Trump of the stadium rallies but something else: a presidential President Trump. He reinforced the American values that the other party and the establishment media have assaulted with great vigor as of recently and in a most poignant moment put faces on the human suffering from the barbaric regime in North Korea. Kim Jong Un and his propaganda machine might seem cartoonish in the West, the misery endured within the borders of the most repressive regime in human history and the very serious threat they pose to the rest of the world are all too real and why all options, including a preemptive attack, need to be considered. 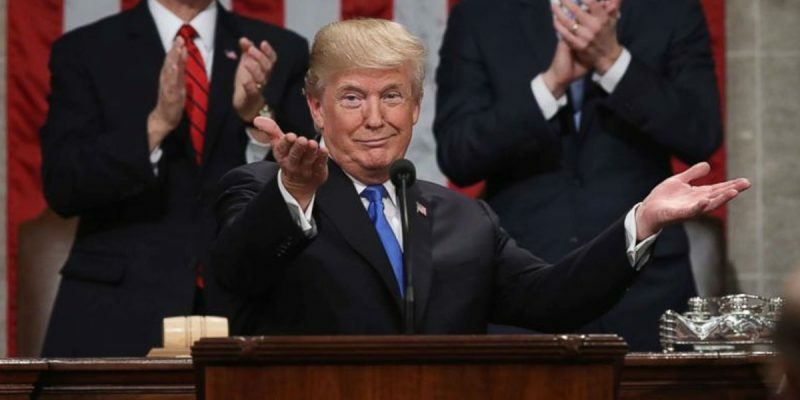 The author of The Art of the Deal used his State of the Union address to reframe the debate over the “Dreamers”, offering a path to citizenship in exchange for a more secure southern border and ending failed immigration practices that are not in the nation’s interests. While many Republicans are not thrilled with a limited amnesty, the Democrats now find themselves painted in a corner as any demands in excess of Trump’s generous proposal will be more than the American people are willing to accept and it will make the Democrats’ attempt at another government shutdown over protecting illegal aliens look that much more unreasonable. The rigged media will have to lie extra hard now to distort the immigration debate. Until the passage of the tax cut, President Trump did not have a signature legislative accomplishment. By getting through the massive tax overhaul, the president scored not only his biggest political victory to date but one that is far reaching and will help transform the unfavorable narrative of his administration consisting mostly of angry tweets and profanities. Trump’s election in itself was an economic boon because it reassured those with capital that the United States would have a favorable business climate. However the tax bill has triggered significant reinvestment in the country, with the return of manufacturing jobs that both parties and the media kept declaring long gone as they advanced the myth that we were no longer a country that builds stuff. With the stock market soaring and unemployment falling, the president is right to lay claim to the reinvigorated economy (in great contrast to his predecessor’s unquantifiable “jobs saved” estimates). Underscoring that their party is a confederacy of dunces, the Democrats had multiple responses. First there were the boycotts, which their Republican colleagues probably appreciated as there was more room in the crowded House chamber. Secondly there were the sad and glowering faces. Seriously, they must have brought in acting coaches from Hollywood or Broadway to teach the Democratic caucus how to grimace like a boss. Nancy Pelosi in particular seemed to really put effort in her “RBF” signaling. That a grandmother who is going on her 78th birthday in March would act so childish on national television is disheartening though indicative of the sophomoric dancing she and her colleagues feel compelled to do to gain favor with their juvenile base. Third was the lack of applause in certain areas. I am not a big fan of all of the applause business. It’s theatrical and slows down the State of the Union but if it’s going to happen, regardless of the party affiliation of the president delivering the address, the prolonged clapping’s lone virtue is that it demonstrates to Americans where the two sides can agree on somethings. Apparently record low unemployment rates in the black and Latino communities are not such areas. Sporting kente cloth to protest the president’s alleged unkind comments about Third World countries, the Black Caucus sat stone faced when Trump touted economic progress that the caucus should be celebrating. It was a very telling moment about whose interests the congressional caucus are really focused on protecting and advancing. Fourth were the alternative responses to the States of the Union delivered by raging millionaire Hollywood celebrities. It’s a wonder how Cynthia Nixon did not choke on her own froth. And then there was the Democrats’ official State of the Union response, aimed at appealing to the forgotten men and women (and transgendered miscellany) of America. Ever the shrewd political operators, the Democrats tapped the millionaire scion of a political dynasty whose relatives have a reputation for treating women like chew toys. Congressman Joe Kennedy IIII is the poster boy for white privilege who was tasked with railing against white privilege. So what has this 37 year old US Representative starting his third term accomplish to merit such a distinguished speaking role? He’s a Kennedy damn it! So the party that met defeat at the polls in 2016 for trying to solidify one political family decided to tag in a member from a more popular clan. But whom was the drooling congressman speaking to? Not middle America but his own party base. Rather than broaden his party’s message, the grandson of Bobby Kennedy decided to use the opportunity to introduce himself to and curry favor with the radical leftist activist element that has hijacked the party that once pretended to stand for the common man. Ginger RFK didn’t help his party and with his awkward speaking cadence didn’t do himself too many favors either. Trump ought to send them thank you notes and champagne for putting the exclamation point on his State of the Union. Previous Article Are You Ready for Facebook Changes? More Censorship?